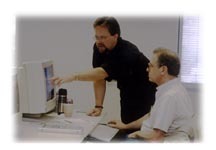 s I offer personalized FileMaker training, on-site or off-site. If you would like training customized to your specific needs or onsite training, please contact me at jmo@filemakerpros.com. I am located in Chino Hills, California. My phone number is 909-393-4664. These training classes were created by FileMaker, Inc. to teach students how to optimize the development, deployment and administration of real-world FileMaker Pro solutions across any size organization. Subjects include FileMaker Pro Server, Relational Database Design, Scripting, Calculations, Reporting and Connectivity. Database Pros is one of only twelve trainers in the United States authorized to teach these courses. New Remote version of this popular training course now available! Save time and money but get the same training! While Database Pros doesn't teach the FTS Beginner module publicly, you can download this self-paced training for free at the FileMaker, Inc. web site. You can also purchase the Advanced FTS training directly from FileMaker, Inc. either in perfect bound or downloadable PDF format. These are the classes I developed based on my wildly popular book and CD ROM, Scriptology - FileMaker Pro Demystified. Philosophy of Scripting 101 is a three day (in-person) or 3 week (remote) intermediate scripting and calculation course. Philosophy of Scripting 201 is a two day (in-person) or 2 week (remote) advanced scripting and calculation course. The curriculum for these classes has been rewritten from the ground up to include more hands-on exercises and the latest techniques for FileMaker Pro 15! To find out more about the curriculum, dates and locations or to register for a class, click on More Philosophy of FileMaker Class Information. Over 5 hours of video instruction on creating an Audit Log in FileMaker Pro 17. Topics include intermediary/advanced topics in relational design, scripting, calculations and plug-ins. 5 hours of video instruction on creating a Password Manager in FileMaker Pro 17. Topics include beginner/intermediary topics in layout design, relational design, scripting and calculations. Over 10 hours of video instruction on creating a calendar in FileMaker Pro 17. Topics include advanced topics in relational design, scripting, calculations and reporting. Over 8 hours of video instruction on document or content management in FileMaker Pro 17. Topics include intermediate and advanced topics in relational design, scripting, container fields and calculations. Over an hour of FREE video instruction on FileMaker Pro 17 all the new features. Over 25 hours of video instruction on FileMaker Pro 16 covering intermediate and advanced topics including relational design, scripting, reporting and calculations. 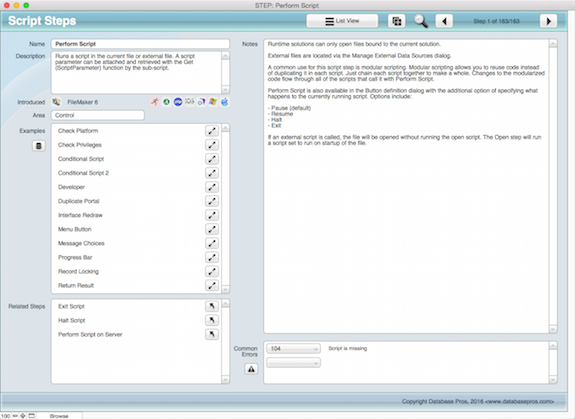 90 minutes of video training, covering the creation of a basic Contact Manager solution at the beginner level. Topics include field creation, interface design, relational design, scripting and calculations. Over 30 hours of video instruction on FileMaker Pro 15 covering intermediate and advanced topics including relational design, scripting, reporting, Filemaker Go, WebDirect, FileMaker Server and calculations. Thirty unique tips and tricks are covered in this video. Each video has a it's own example file to help you delve even deeper into the details of the solution. Multiple levels including intermediate, advanced and expert techniques are offered to please all levels. This FREE Introductory course on FileMaker covers all the essentials for some who has never seen FileMaker before including data entry, find mode, importing Excel data, printing, sorting, fields, scripting and calculations. Hundreds of scripts, error numbers and much more! Even though it contains reference material, the purchase comes with the full access password so you can see how it was created! Click here for more information about the Script Reference. 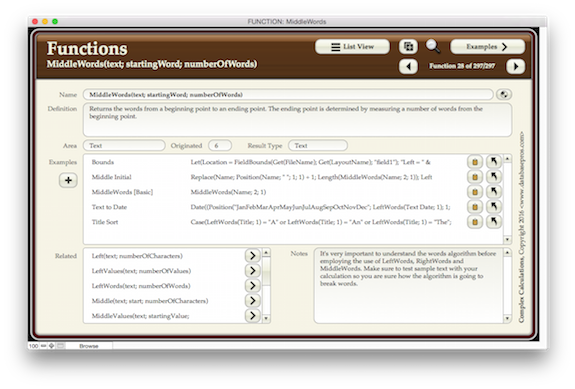 All FileMaker functions defined along with examples and related functions. Add your own examples with the browse mode calculation creator. Click here for more information about the Complex Calculations. The Template Set contains 11 templates that mimic the OSX System Software so you can integrate your FileMaker solution seamlessly into an OSX environment. This template set has been completely rewritten from the ground up to include dynamic scripts, calculations, interface elements and much more. Click here for more information about the Template Set. I'd love to come to your company site and teach you FileMaker Pro intermediate and advanced scripting, calculations, relationships and other techniques. If you have five or more employees, the cost is about half the price of sending them all to one of my public training sessions. + The FileMaker Training Series classes are also taught publicly across the United States. More information..
* The Philosophy of Scripting classes are also taught publicly across the United States. More information.. If you'd like to find out more, send me an email at jmo@filemakerpros.com or call me at my office in California at 909-393-4664. I really love teaching people how to use FileMaker Pro. It is so exciting to see that light bulb go off in students' heads when they finally understand a FileMaker concept or learn something they never thought FileMaker could accomplish. If you are struggling with the cost, travel or time commitment for a quality FileMaker class, perhaps some former students of mine can convince you. I get tons of testimonials every time I teach a class, and I am always amazed at how my classes change the lives of the students. Click on the training testimonials link to see how my classes have changed people's FileMaker lives! All of our trainers are certified for all versions of FileMaker Pro! If you can't afford the time away from work or you require a very specific solution, I offer GoToMeeting training and consulting. This allows you to customize the training to a specific area or have me assist you with a specific issue. I'll even send you FileMaker files demonstrating any techniques we cover during the session. If you aren't familiar with GoToMeeting, it is a service that allows two or more people to share and control their screens. GoToMeeting is the best collaboration tools I have ever used! If you are interested in talking to me, call 909-393-4664 PST or email me at jmo@filemakerpros.com. s This site runs entirely on FileMaker and PHP because I wanted to demonstrate that FileMaker really can do it all!